Elite Nails Hand, Foot and Body Spa: Meet the New Faces of Elite Nails - Edgar Allan Guzman and Shaira Mae dela Cruz! 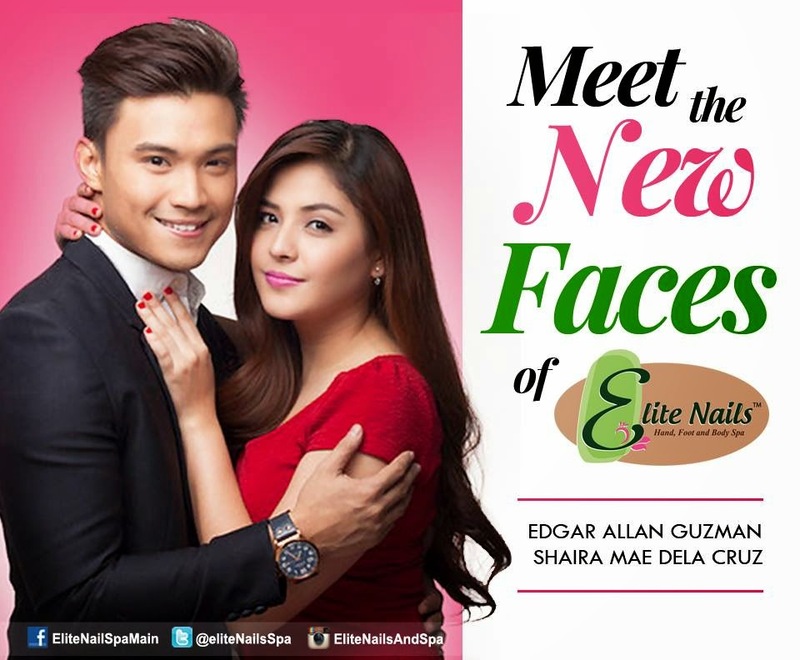 Meet the New Faces of Elite Nails - Edgar Allan Guzman and Shaira Mae dela Cruz! Great news to start our month of August! Two exclusive talents of TV 5 recently signed up with Elite Nails Spa, as its new endorsers. Guess who are these new additions to the growing number of Elite Nails Spa lovers? No other than the multi-awarded actor Edgar Allan Guzman and one of TV 5’s freshest faces and aspiring actress, Shaira Mae Dela Cruz. Edgar Allan Guzman’s notable entry in showbiz is when he clinched the title as Eat Bulaga’s Mr. Pogi back in 2006. He became a household name in noon-time tv during his Eat Bulaga stint before he was given opportunities to do indie films and in mainstream. But it was in indie films where his acting skills are honed and flourishes and earned him various awards here and abroad including a top acting recognition from the prestigious Cinemalaya 2011 for the movie ‘Ligo na U, Lapit na Me’. He has also received rave reviews for his performance in ‘Bona’, a PETA production that run in 2012, where he played the lead role opposite the prized actress, Ms. Eugene Domingo. ‘Bona’ is a stage adaptation of the critically-acclaimed motion picture of the same name, directed by the late Filipino film director Lino Brocka. Edgar Allan, a Famas Youth Achievement Awardee, also became a member of various sing and dance groups before he is touted today as the new prince of Filipino Indie films. Meanwhile, Shaira Mae Dela Cruz is a commercial model before she became an alumna of Artista Academy, a reality-based talent show aired in TV 5 last 2012, she was part of the Magic 6. After her stint in the academy, she appears in a music video for Jungee Marcelo’s “Pansamantagal” performed by Sitti and Julianne Tarroja where it won 2nd runner up in PhilPOP songwriting festival. She played a villain role in the series ‘Kidlat’ and landed more support roles in other Kapatid network shows prior to becoming one of the main cast of ‘Madame Chairman’ with the mega star, Sharon Cuneta. She was also part of the recently concluded series, ‘Confessions of A Torpe’, where she had a chance to work with Edgar Allan on cam. Both Edgar Allan and Shaira Mae exude a fresh aura and fun personality that embodies Elite Nails’ mantra – to provide fun pampering at any time of day! It was indeed a light afternoon of shoot with the two of them as they match the mood of everyone working in the set – all fun and positive. Having Edgar Allan and Shaira Mae in our family, we also wanted to provide our patrons the same fun and positive outlook through living a healthy and balanced lifestyle in our daily living. Edgar and Shaira are both busy persons in their respective careers but they manage to give themselves a break to visit a spa once or twice every week to relax and rejuvenate their tired bodies. For Shaira and Edgar, spending a time-off in spa is indeed a necessity for celebrities like them in order to live a healthy and active lifestyle. Stay tuned for more of Edgar Allan and Shaira Mae as they appear in Elite Nails’s new advertising campaigns soon!